The program I wish to nominate is currently being implemented in and around Grace Hill Elementary School in Rogers, Arkansas. Ryan Finley, a special education teacher of 6 years, initiated the program. The project began with the awarding of a local grant enabling the school to begin composting spoiled cafeteria food and other organic scraps in either of two composting units. Within the classroom, the students in Mr. Finley’s class are able to feed their 4000 plus worms any and all available appropriate organic waste. Outside of the classroom is a large in-vessel composting unit able to handle much more of the waste the worms cannot handle. Throughout the school day, the students in Ryan’s classroom learn in a very hands-on manner, the different aspects of energy conservation and the importance of the three, sometimes four “Rs” (reduce, reuse, recycle, and rot). 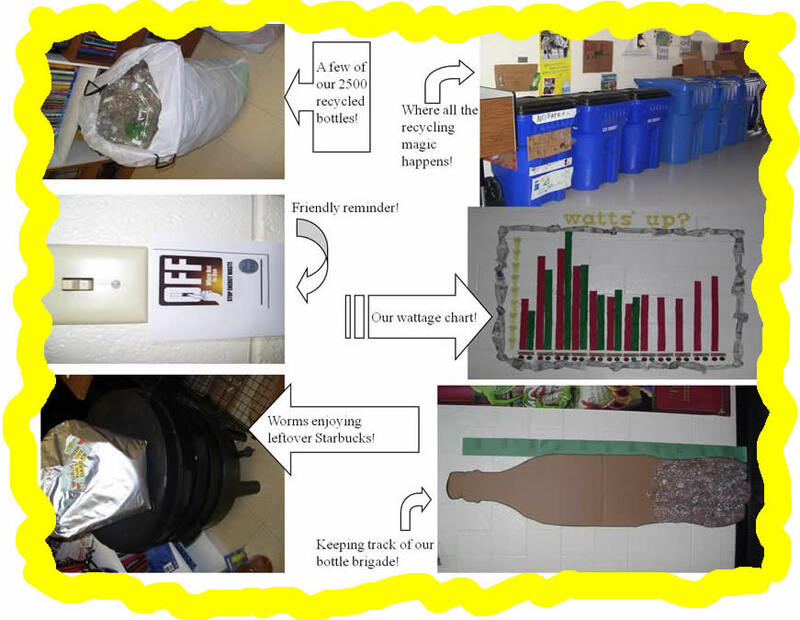 The class is the hub of the recycling movement in Grace Hill…all manner of waste enters the door of room 301. The class handles all of the plastic bottles recycled by the students, faculty, and parents of Grace Hill. All of the 20 ounce soda bottles are delabeled, rinsed, and the caps removed, then stored for shipment to TerraCycle in Trenton, NJ. TerraCycle uses the bottles to package their own brand of worm waste fertilizer. The class is also instituting a brand new program of recycling foil energy/breakfast bar wrappers. These wrappers are reused by TerraCycle to manufacture new products varying from handbags to wallets. Along with the plastic bottles/containers, the school also recycles aluminum soda cans, managed by a third grade class, who has already recycled close to 200 pounds of aluminum. Throughout the building, you will find friendly reminders to “shut it off” when not in use. This idea came about to help the school monitor its energy consumption. In the hallway you will find a graph, charting the usage of electricity for the school. The energy consumption from this year is compared to the usage from the previous year with the idea Grace Hill can cut down on their Kilowatt Hours used each month. The school is also recycling around 900 pounds of paper products every ten days. The recycled paper is picked up by a local agency, free of charge to the school. Previous to the assistance of this new company, the school was only recycling white copy paper. Now, all food-free paper products are recycled without the need for sorting, including junk mail, magazines, newspapers, and books. 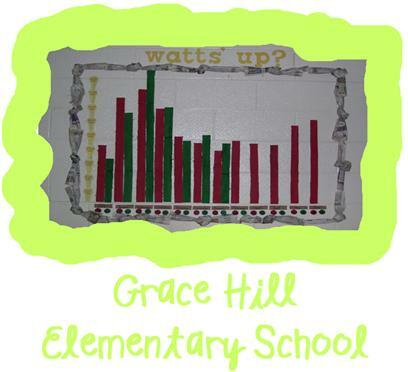 The students of Grace Hill are known as the Responsible Recyclers. This crew of two goes around each afternoon and collects the paper scraps from each classroom, the library, and the office. The Responsible Recyclers are just that…they are required to earn this privilege with good work and great character during their school day. Mr. Finley’s class has also ventured into the realm of papermaking. Though this is an easy process, it has not been as fruitful as planned. The process has, however, allowed Ryan to infuse math and science into the academic process. What fun learning this is for the children! The school is also now using laminated lunch forms for each class. Previous to using the new forms, each of the 22 classes used a new sheet everyday. Each of these sheets was promptly thrown in the trash once the lunch count had been totaled…let’s do the math: 22 classrooms multiplied by 187 days…hmmm…4114 pieces of paper just on the lunch count. Wow, what a savings! The school has just recently added to their program ink/toner cartridge and cell phone recycling. The school is also participating in Wal-Mart’s Recycling Challenge, collecting all forms of plastic shopping bags. Mr. Finley’s program at Grace Hill has been recognized three times in their local newspapers with a short feature on a local news program. The Go Green Initiative, based in California, has also recognized Grace Hill as its school of the week. This recognition reached an international level via an email notice sent to the 48 participating states, their schools and the participating countries worldwide. Treehugger.com, a subsidiary of the Discovery Channel, also featured Grace Hill’s efforts in a story on their website. Grace Hill was awarded a Coke/National Recycling Coalition grant enabling the school to gain five new recycling bins to further their efforts in plastic and aluminum recycling. This program has moved outside the school walls, touching families and the community as a whole. Parents and students alike have shared, via surveys and word of mouth, how much more aware they are about their waste and what they choose to do with it. Students, teachers, and parents are continuously bringing their recyclables to school in a community wide effort to reduce the amount of waste making its way to our local landfill. There have even been a few people who have made comments about never before feeling like they could recycle…now they find it to be easy and they have become more aware of the necessity to reduce their own waste production. Mr. Finley’s class has also created a school newsletter focused on recycling with tips and information for students and their parents. While Ryan is a classroom teacher and unable to enter each and every classroom to teach students all of the necessities of recycling, the students through out the building get friendly reminders from faculty and staff to do the best they can and to help educate their parents on these important matters. Another community outreach program implemented by Mr. Finley allowed a guest speaker to come and speak to each 3rd, 4th, and 5th grade classroom and share with them the importance of reducing the number of plastic bags they use when shopping. The speaker was kind enough to bring each student in these grades, as well as the entire staff, a free reusable shopping bag for their home use. The students were asked to take these bags home with them and share with their parents the importance of cutting down on the use of plastic shopping bags. At this time, and due to the nature of Ryan’s classroom, the ability to do this recycling work outside school hours has not been a possibility. However, Mr. Finley has contacted the University of Arkansas to begin a program in which his students or other volunteers will assist in the cleaning up of the sports facilities after events. Mr. Finley has also been invited to the Botanical Gardens of the Ozark’s annual Earth Day Celebration to discuss the many aspects of his recycling program. With this celebration being held during the school week, Mr. Finley will not be able to attend due to the special needs of his classroom. However, The Botanical Gardens, along with volunteers from the local Old Navy store, will be filming a video that is to run continuously throughout the Earth Day Event. On March 29, Mr. Finley will be a featured speaker during the Botanical Garden’s continuing education Earth Day for Teacher’s event. Just recently, he was asked to speak to the school board regarding the GO GREEN program he has implemented at Grace Hill. At the end of the speech, the Rogers District Superintendent stated the need for more GREEN initiatives throughout the district.